We walked around the vibrant city. So nice and warm and so full of young people. Santiago has a great amount of universities. I don't know how many but seemed to be way more than a dozen. We saw some effects of the 'terra moto' from last Feb, but for the most part all was at 100% back to normal. Chile did not ask for nor did accept any money from the international community for the repairs from the earthquake. 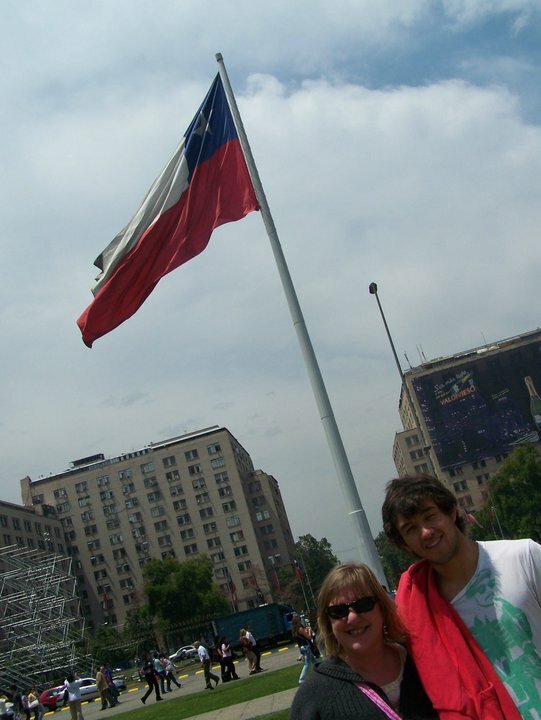 Chileans are very proud of their country - as they should be. Their bi-centennial was this past year. The main damage from the was earthquake was in Concepcion, six hours south of Santiago (more about that later too). Earthquakes are a part of life for Chileans. In talking about my vacation today to one of my employees, he mentioned that he saw on TV or somewhere that Chile has the most volatile fault on the planet and it is likely that a terra moto 300 times the strength of last Feb's can happen at any time. Let's hope not. We saw the federal buildings. The 'white house', the legislative building and the judicial center. We took photos by the guards, which like in Scotland yard, they cannot move while on duty. 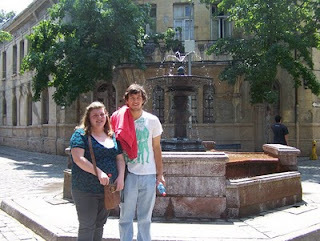 Juane took us to some very nice neighborhoods in Santiago - he was a great tour guide. I think when you live somewhere you don't always get to see the 'touristy' things. 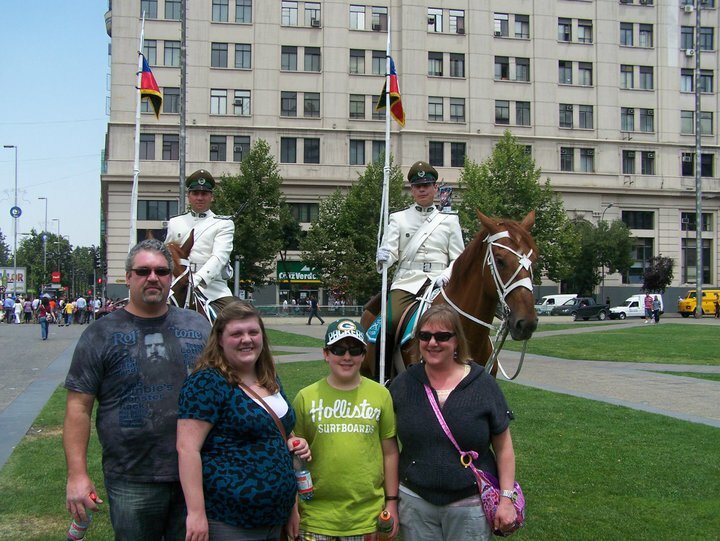 We were definitely tourists this day. We went to a place similar to Greenwich Village in NYC where there used to be a lot of the artists and musicians. The architecture in all of Santiago is beautiful. With the minimal change in temperature extremes, the streets and buildings can last a very long time. I saw no homeless people, no beggars, minimal garbage. I did not feel like I was in a third world country at any time. Chile is beautiful and seems very progressive. One oddity to me however, were the stray dogs. They are everywhere. They don't seem to bother anyone and don't even see much of the mess from them - but they are definitely there. We met Monique again for lunch. She and her family were staying at a hotel in the city and her kids were really enjoying Santiago. In Rio they live in an apartment on the second story where they don't get to run around much. 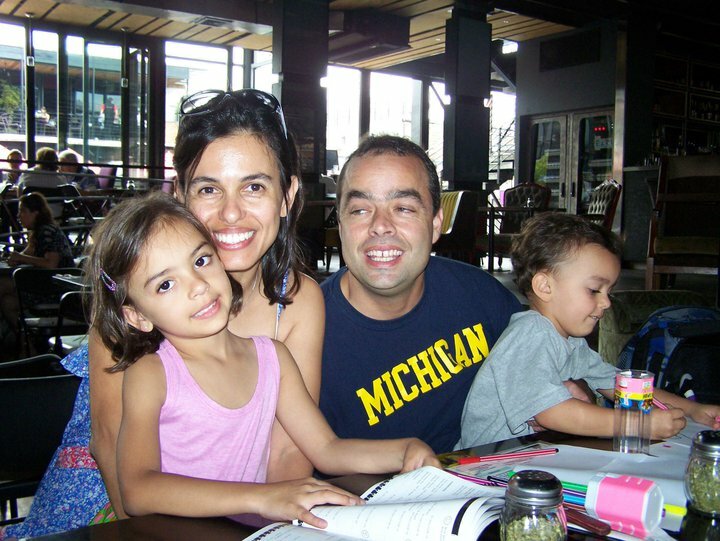 They loved Chile and they also love Michigan for that same reason. For lunch I had Salmon and other seafood - was excellent - but so filling. It was a nice time and good conversation. Santiago has a gorgeous city park, similar to NYC Central Park, I think. It is many blocks long and just beautiful. We walked across the main river in Santiago, in summer it was pretty shallow and muddy but still ran very quickly. By the time we got home it was 7:00 PM. Had a light dinner, similar to the breakfast food. Good night day 2. Tomorrow, we on our way to Vina del Mar for New Years! Lot's more to share. Lots of memories to recall.